Home > Snoring Remedies > Can An Anti Snoring Mouthpiece Improve Your Sleep? An anti snoring mouthpiece may not be something you've considered but if your sleep is regularly being interrupted by snoring, it just might be the answer you need. Snoring can be an indicator of more serious problems, but even mild cases of snoring can disrupt your natural sleep pattern, leading to insomnia and other health issues. As such addressing your snoring is always a good idea. Snoring is caused when the tongue or airway tissue relax during sleep and fall back against the back of the mouth, causing a temporary airway restriction. That snorting sound that you hear many people make in their sleep is a response to this restriction. In most cases, it only happens occasionally and is not serious but in some cases, snoring becomes persistent and this is when it should not be ignored. There are times when persistent snoring has a physical cause, such as getting into the wrong sleeping position or being overweight. These causes can be addressed directly rather than by using an anti snoring mouthpiece. Avoiding lying on your back or shifting positions if you realize you are snoring can resolve the issue. And because carrying extra weight can exacerbate airway restriction, losing weight may be a relatively easy solution. There may be other physical features that can increase your risk for snoring, including enlarged tonsils, a receding chin, or a deviated septum. In some cases, snoring can be a side effect of sleep apnea, a potentially serious condition that involves repeated instances of airway restriction during sleep. Because of this possible connection, it is always recommended that you discuss your persistent snoring trouble with your doctor. Is it time to consider getting help to stop snoring? If your snoring is seriously disrupting your sleep, your doctor may recommend using an anti snoring mouthpiece. This is a device that is worn at night and is designed by a dentist to actually change the architecture of your mouth in order to avoid airway restriction. These mouthpieces, also called mandibular advancement devices, counter the natural tendency of your tongue to slide to the back of your mouth and your jaw to relax during sleep. They achieve this goal by doing a number of things, including stabilizing receding jaws; pushing the jaw forward slightly to keep the airway open; depressing the tongue so that it doesn't fall to the back of the mouth and ensuring that the soft palate tissue also doesn't relax and block the air passage. Because they actually change the position and function of your mouth, it is highly recommended that you only use a mouthpiece that has been individually fitted by your dentist. It is possible to buy an over the counter anti snoring mouthpiece, like the Good Morning Snore Solution, but you might want to have your dentist fit a mouthpiece specifically to your mouth. Even with this type of professional fitting, it still may be possible to experience some discomfort and excess saliva production when you use your mouthpiece, but most people adjust over time. Any way you look at it, snoring is more than just fodder for jokes. For many people whose sleep is regularly disrupted, it can become a serious health concern. 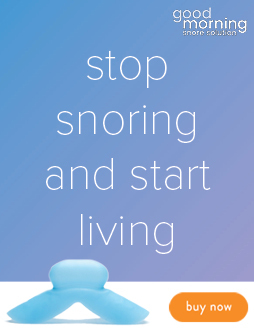 If this is true for you, then talk to your doctor about the possibility of using an anti snoring mouthpiece to help calm the snoring and get the rest you need.